The Razorbill, like its close relative the Guillemot, is a member of the auk family (Alcidae), and nearly 200,000 of them breed in UK coastal habitats. Razorbills bear a passing resemblance to penguins, which is hardly surprising because penguins are also members of the Alcidae; but whereas Razorbills fly, penguins are unable to do so. In the water, however, the similarity is more obvious: like penguins, Razorbills swim by using their powerful wings as paddles. 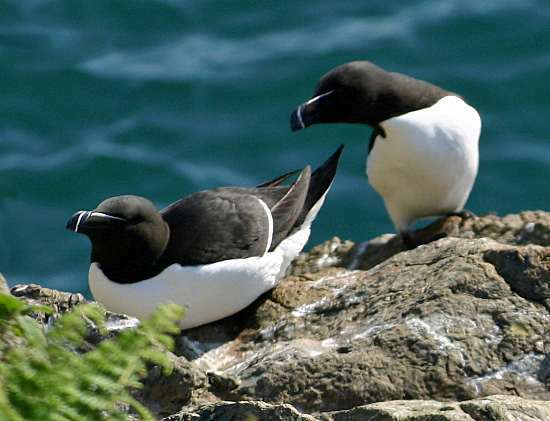 One of the largest of the auks seen in Britain, Razorbills are about 40cm long and have a wingspan of some 65cm. Coming to shore in the summer months only to breed, Razorbills spend the winter in the northern Atlantic. The best time to see them on coastal cliffs is from the end of March until the end of July. 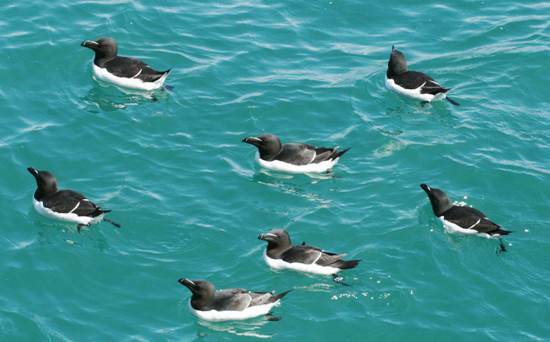 Scotland has huge colonies, but western coasts of England and Wales are also also good places for seeing Razorbills. 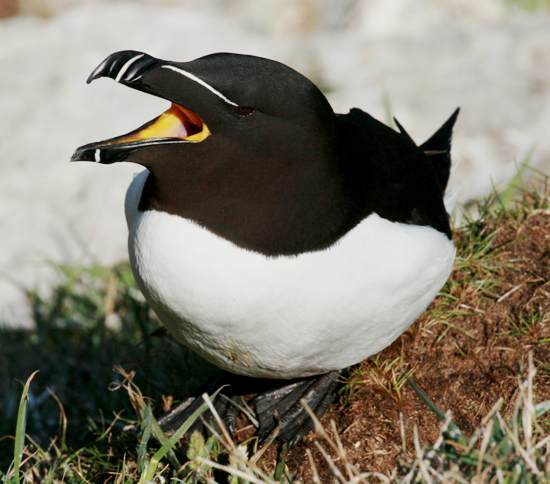 Making no nest, the Razorbill lays a single, large egg, white with brown markings, on a cliff ledge, often with dozens or even hundreds of others packed in close to one another on tiers of such ledges on a rock face. The eggs of this seabird are quite sharply pointed and so if they do roll they tend to go in tight circles - a useful feature given the limited space available!